Icelandic group FM Belfast have become known for their energetic live shows. 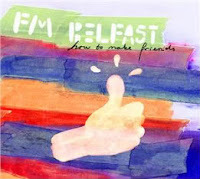 And, when t hey released their record how to make friends locally it sold over 5,000 copies. Now, the band has announced they're ready to take on the US and will release how to make friends over here, this spring, on Kimi Records. For a taste of what's to come, check out "Par Avion" below.